On April 25, 2015, a massive 7.5 magnitude earthquake rocked the country of Nepal to the core. It was the biggest earthquake in that region since the 8.0 magnitude Nepal–Bihar earthquake in 1934 which killed 10,000-12,000 people. The earthquake and its aftershocks have killed well over 8,000 people. These earthquakes have absolutely devastated Nepal, both from the loss of life and the damage of the country’s infrastructure. Although the country of Nepal is halfway across the globe from us here in Amarillo, this tragedy hits particularly close to home. 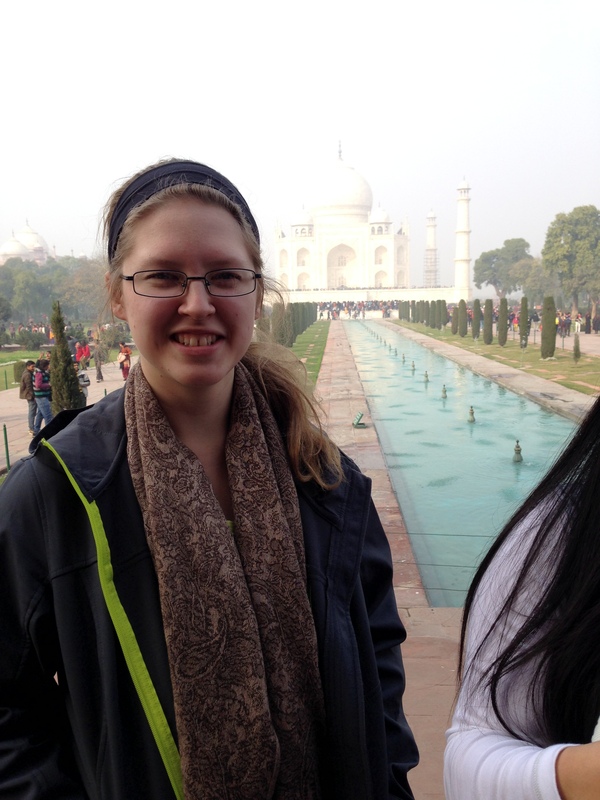 In January of 2015, 19 of Amarillo College’s Presidential Scholars visited the countries of Nepal and India. If you asked any Presidential Scholar what their favorite part of that trip was, I can almost guarantee you that they would say our time in Nepal; even though we were only there for a small fraction of the time we were in India. We did not grow to love Nepal because of their beautiful landscape, the incredible food, or the countless little shops housing families who have been making the same incredible items like tapestries, wood carvings, or clothes for countless generations; although these things certainly increased our fondness. We fell in love with the people of Nepal. Coming from the Southern United States, distinctly known throughout the country for our hospitality and kindness, I thought that I had a fairly high standard for what generosity and altruism encompassed; that is, until I went to Nepal. The people of Nepal are by far some of the kindest, most generous people I have ever had the pleasure of meeting. From the moment we stepped into the country, we were surrounded by people who offered us the best of what they had, even if that was simply a spot beside them on the sidewalk or a genuine smile. While in Nepal, we stayed in the Sri Arubindo Yoga Mandir; an ashram (essentially a home and school for orphans and unfortunate children) in the Himalayan hills surrounding Kathmandu. These children and their caretakers, residents of the ashram, welcomed us into their home spectacularly. They cooked for us, cleaned for us, and walked us through their daily chores as we attempted to help them, with incredible grace and patience. In the city, people spoke to us without hesitation, offered explanation for unfamiliar rituals, showed us the best places to capture photos, and offered us chai masala and snacks wherever we went. All in all, these people were the most genuinely kind and generous people that I have ever been around. Knowing this and remembering these people, it makes the tragedy that has befallen Nepal absolutely heartbreaking. Knowing that the wonderful people of Nepal are having to deal with this terrible tragedy is so heartbreaking because we know how kind and generous they are. They would never have deserved this; but of course, no one deserves a tragedy like this earthquake has caused. I have no doubt that the citizens of Nepal are caring for each other with all of the selfless generosity and genuine love for each other that we experienced, plus so much more love and care than we could have seen in our short time there. My biggest fear is that the world will soon forget about the little country of Nepal and cease to provide the financial support they so desperately need. Nepal will forever be close to my heart, but never more than it is now. Traveling with a group of people who just being around make me want to be the best I can be and who encourage me in all aspects of my life, as well as being around people who challenge me intellectually and make me want to understand more about the world, was hands down my favorite part of the trip. I have made friendships in this short period of time that I never imagined I would have. Second of all, the inspirational people I got to meet while abroad changed my whole perspective on how to change the world and of humanity in general. The PEPY organization we got to work with during our time in Nepal embedded in me a new love for humanity and awareness that my actions to change the world do not have to be giant revolutionary leaps but can be small hops for the people I encounter every day. The whole idea that “small acts of compassion can start a chain reaction” I now know is definitely true. The kindness, generosity, and genuine care I felt from PEPY was infectious and I could see it in the whole Scholars group. Because of the trip, as Steve Jobs once said, I think I have figured out how I can make my own “dent in the universe.” I am eternally grateful to be a part of the Presidential Scholars family. A reflection on the recent Presidential Scholars’ excursion by biology major Amy Bannavong. Mahatma Gandhi once said, “Happiness is when what you think, what you say, and what you do are in harmony,” and from our recent trip to India and Nepal, I have found the true meaning of his words. Prior to the trip I thought that I had the short end of the stick of life: growing up in poverty on the north side of Amarillo was, in my opinion, rock bottom. I never had the childhood that most kids had; everything from clothing to toys were hand-me-downs from relatives and my mother worked from paycheck to paycheck six days a week so I never saw her as much as I wanted to. Life was rough for my family and I, or so I thought. When we set out on our trip I had no expectations: I wanted to go in with an open mind. It didn’t take a full day in Nepal for me to realize that I have been eternally selfish my entire life. The difference of how children are raised in India and Nepal as compared to in the United States is as different as fire and ice. Growing up I always had a roof over my head, clothes on my backs, and the comfort of knowing that food will always be in my stomach–children in India and Nepal however, do not have that satisfaction. I had never seen so many men, women, and children out on the streets before, yet these individuals seemed to be more tranquil and happy than any wealthy person in the U.S. Material goods did not mean anything to them as it does for us. There were many things that impacted my life while our time overseas: experiencing another religion, learning about different historical monuments, and experiencing unique foods; however, I feel the most valuable thing I learned over there was how to live. I have everything in the world compared to most individuals over there, yet, why are they so much happier than I am? In Nepal we went to an Ashram where this one individual, Swami Ji, gave everything up in order to buy land and take in orphans and help them survive when everyone has given up on them. Why? He simply felt like it was the right thing to do, to help others. His way of living is also astonishing. Here, every child’s brain is branded with the fact that we need to plan our lives… we need to make the choices that would give us a bright future. By doing this, we are so worried about what is going to happen in the future, we forget about what is happening right now. Swami Ji taught me that although planning is important, it shouldn’t be stressed. The one thing that I will value the most for the rest of my life is that there is a difference between being alive and living. 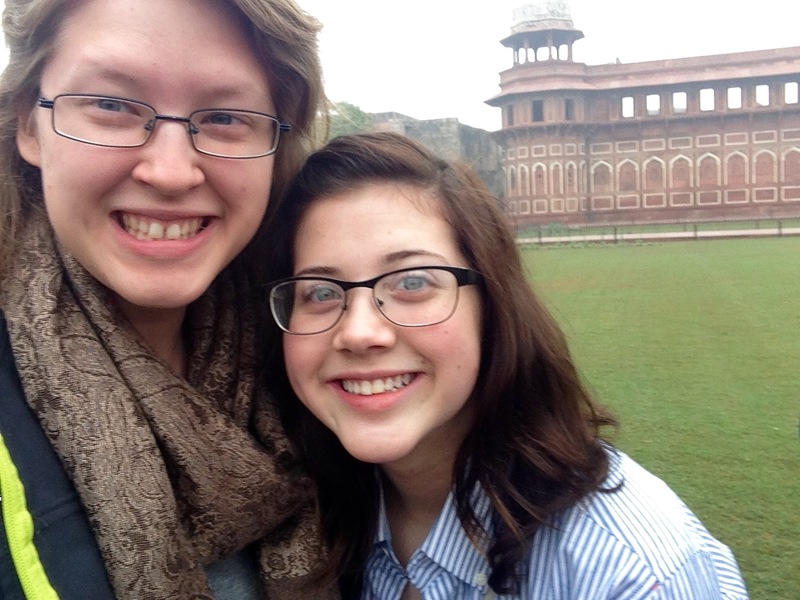 Presidential Scholars Brittany Love and Lily Gamble pose for a picture during their excursion to India. I had never ventured out of the country. I had never flown. I had never experienced anything positively life-changing. Until my trip to Nepal with the Presidential Scholars. Leading up to our departure, I was consumed with anxiety. It devoured my thinking and pulsed through my body with every breath I took. The Unknown has always sparked my nerves and quite frankly inhibited many opportunities I have been given in life. About a week before our endeavor, I contemplated backing out of the trip, and had there not been a financial obligation, I would have. Thankfully—and I deeply mean that—I decided to pull myself together and get on that first plane of many towards the biggest adventure of my life thus far. Needless to say, after not having a panic attack, contracting deep vein thrombosis, or dying, I was pumped for the rest of the trip. We landed in Nepal on January 7. My morale skyrocketed after meeting Claire, a representative for PEPY Tours https://www.facebook.com/pepytours, which was the company we worked with. She was so genuinely excited to see all of us that the difficulties of traveling seemed to fade away. That night, Claire and two other PEPY workers led a few ceremonies to help connect us to Nepal and each other. It’s difficult to express how meaningful this night was for me. To be able to shed away all the walls that are built up when surrounded by peers and just simply be vulnerable with each other was amazing. We woke up early the next morning to begin our adventures. I can’t possibly fit in all the wonderful experiences that I was exposed to in this short article, but I want to touch on my time at the Ashram. For those unaware, an Ashram is a place of solace for orphans and troubled kids who have nowhere else to go. These children are able to live, eat, and attend school completely free in exchange for working within the community. All the Scholars were welcomed with open arms by the founder, Swami Ji. We were able to hear his life story and the story of the Ashram’s beginning. Swami Ji endured trials throughout his life that could cast a great shadow over mine; however, he stood resilient and proud of them. Clearly, he didn’t spend a second worrying about his past and the bad it held, but rather the positivity and good vibes of the people around him. I have struggled for the longest time with not letting go of my past; it has haunted me for as long as I can remember, and it would have continued to haunt me had I never encountered the greatness of Swami Ji. His resilience inspired me to accept the past—accept that it happened and that it has shaped the person I am today—but to move on and accomplish great things with the time I have left. Spending a second worrying about the past is wasting a second in the present, and for this realization I want to seriously, greatly, and epically thank Swami Ji. All that I have learned from my trip would not have been possible if it weren’t for Amarillo College and their investment in me as a student. This time in my life will forever be held close to my heart, and I can’t thank AC enough for that.